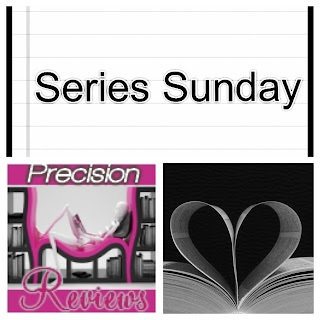 My Series Sunday pick is Daughter of Smoke & Bone, the first book in the trilogy of same name by Laini Taylor. A supply of teeth is running low in a dark and dusty shop. Black handprints appear on doorways. A bright blue-haired tatted up young art student, Karou, is caught up in an otherworldly war. Her sketchbook is filled with creatures she'd been drawing since she was a little girl: Issa, the woman serpent with bare breasts and the face of an angel; the giraffe-necked Twiga with a squinted eye; parrot-beaked Yasri with orange curls; the bird-like Kishmish that flutters away as a messenger; and the grumpy Wishmonger/Resurrectionist Brimstone. Of course Karou's friends think her trademark characters are fantastical. Only Karou knows they may be real; the single word tattoos on each of her wrists are a hint in plain sight: true and story. Yes, you are on www.LiteraryMarie.com and read the book description right. Bookhearts know that I am not a paranormal fiction reader (with the exception of the Twilight series). Yet I still chose to start the Daughter of Smoke & Bone trilogy based on the eye-catching cover, 150,000+ positive book reviews, and rave ratings from over half of my Goodreads friends. I finally borrowed the hardcover from the local library when my bookheart Steph highly recommended this series. I always trust her judgment on books. So here I am reviewing a fantasy/magic/nonhuman novel. Was Daughter of Smoke & Bone worth stepping out of my comfort zone? YASSSS!!! One of the best bookish feelings is when a book turns out to be better than expected. Karou is such a strong, mature and smart heroine. The descriptions create vivid imagery and made me forget it was fantasy. The setting is in a place called Elsewhere. Oh, Laini Taylor, what an intriguing world you built about seraph and chimaera through beautiful narration. I will stop here; it is impossible to go into further detail without writing spoilers. Trust when I say Daughter of Smoke & Bone lives up to the hype. I encourage those like me to put aside your reservations or dislikes of this genre and give this trilogy a try. Check out the book trailer tease below then add it to your bookshelf if you haven't already. 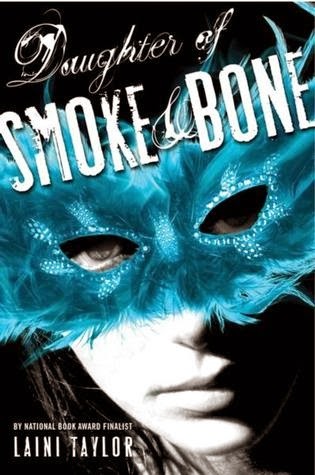 If you are one of the bookhearts that already rode the Daughter of Smoke & Bone train, share your thoughts. I already love this trilogy. Do you?